Ever wonder how the trails stay open and passable? Where do those colored marks on the trees come from? Take this workshop on the Long Path to find out! Trail Maintenance is clearing, cleaning, and blazing. Trail maintainers use small hand tools to clip and cut brush out of the trail, remove debris from drainage structures, and paint or hang the markers used for route finding also known as blazes. 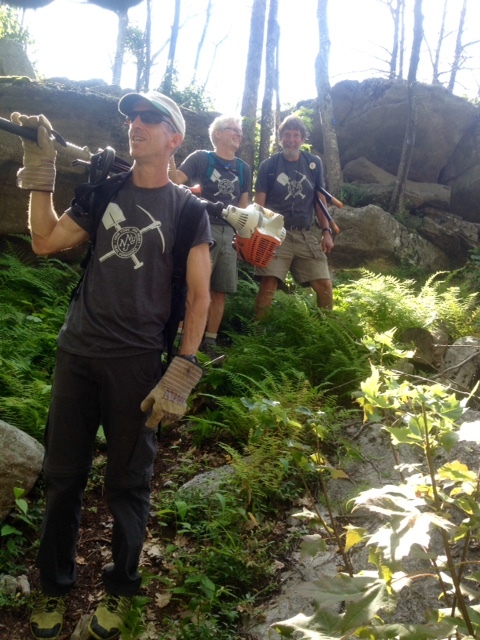 This course helps you gain or brush up on the skills necessary to a Trail Conference Trail Maintainer Volunteer. Skills include how to clip trail corridor, clean drainage structures, proper blazing techniques, and reporting trail conditions. We will meet at 9:00 am in the parking lot at Aroma Thyme Bistro on 165 Canal St, Ellenville, NY 12428. We'll be working along the nearby Long Path. Bring LOTS of water, lunch, work gloves, and friends. We will have a limited number of tools to loan. If you have your own loppers, hedge shears or hand saw, please bring. We offer on-the-job training with experienced leaders. The day will end at approximately 4 pm back at Aroma Thyme for drinks. Please sign up below so we can look out for you, and bring extra tools if needed.